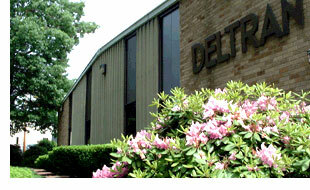 Deltran Corporation has been in business since 1961 and is fortunate to be located in North Attleboro, Massachusetts. This particular area is unique to the metal fabrication industry because of its history. The Attleboros, at the turn of the century, were the largest jewelry manufacturing group in the world. The companies that supplied the jewelry firms with flat stock developed special bonding methods to reduce the gold content of the strip stock. So today, the Attleboros have the largest concentration of flat stock companies in the country. These companies use a variety of bonding techniques that are used in the electro-mechanical and electronic industries. This allows Deltran the advantage of being able to pick and choose the right process to suit your application. Step One: To insure "just in time" delivery, your order has to have proper attention. Our team in the office is dedicated to that end. Because of the availability of material suppliers, they then strive to get you the best price and delivery. This is a major advantage over most of our competitors. Step Two: One of the most important steps to a quality product is tooling, and central to Deltran's operation is precision and design ingenuity in tool making. It begins at the drawing board, where experienced tool engineers incorporate the latest techniques and methods into durable, accurate designs; and it continues with strict control of tool fabrication by professional, skilled tool makers. To augment our highly qualified staff, we continually strive to keep our tool making techniques, machinery and equipment current with the latest developments. Complete and painstaking control of this function eliminates many production problems before they begin, which means higher yields, less waste and consistently held tolerances. Over the years Deltran has obtained a reputation for solving some of the more difficult configurations. Step Three: In the Metal Fabricating Industry today, Quality Assurance has become the most important factor. The only way to assure good quality is to have the necessary controls in place. Our Quality Team has the latest up-to-date program, such as S.P.C., J.T.T. and Min/Max Inventory Control for our customers. Because of the use of carbide in our tooling, we can assure you parts of a consistently held tolerances from lot to lot. Every step in Deltran's operation --- from order entry to shipping --- is designed with you, the Customer, in mind. As a result, we have become an ISO Certified facility. © DELTRAN | All rights reserved.